At times, shifting the patient from one place to the other becomes necessary. 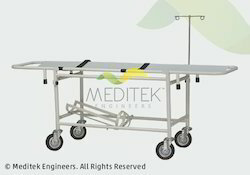 On such occasions, thoughtfully developed Patient Transfer Trolley plays a crucial role. 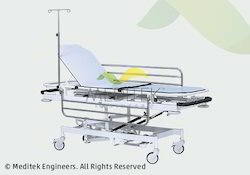 It is specifically designed to provide support while transferring the patient. X-ray permeable two section top with pushing handle covered with PVC grip. Sliding X-ray cassette holder tray. Height adjustment by imported hydraulically operated type linear actuator pump foot operated actuation. Trendelenburg and reverse trendlenburg by gas spring mechanism. S.S. Swing away side safety railings. Approx 50mm x 25mm CRCA rectangular tube frame. Two section X-Ray permeable detachable top & full length X-Ray cassette holder. Two separate screws for height adjustment trendelenburg & reverse trendelenburg position by individuals SS folding handles. Swing away type SS railings on both sides & rubber buffers on all corners. 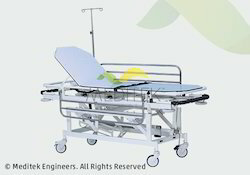 IV rod (Code: 514) with two location & oxygen cylinder holder. Overall approx. 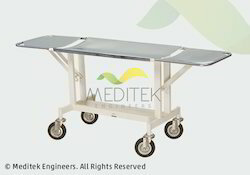 size: 2020mm L x 590mm W x 740mm H.
Trolley mounted on four 150mm-dia heavy duty castors. SS plain IV rod with two location & oxygen cylinder holder. Alternative : 3302-A Fully SS. Overall approx. size: 1850mm to 990mm L x 560mm W x 795mm H.
Mounted on four 150mm-dia heavy duty wheels. Looking for Transfer Support ?